This was taken during our last getaway in Korea. 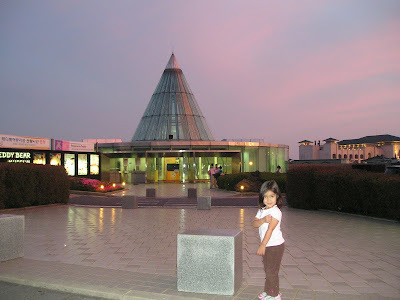 We went to the beautiful Jejudo or Jeju Island. This is a kids museum that we passed by when we went for a walk to look for a local cuisine place in the area. Ain't the sky look so pretty? Quite an impressive sky, looks kie a delicate watercolour with alizarine crimson & ultramarine blue ! Oh, such lovely pastel sky! I love it! And a very interesting looking museum and an adorable little one! Marvelous capture for the day -- any day! Have a wonderful weekend! And your daughter is so lovely too to complement the sky. Mommy Rose your Rylie is a cutie talaga. Walang pamana ang background hehe. Happy Friday! It's nice to look at your photos taken in Korea. They evoke memories of your wonderful stay in Korea. Thanks for the post. God bless you all always. awwwwwww...I love looking at the sky pag pastel ang kulay. Thank you for sharing this very pretty place with us from your country. However, the sweet little girl is the best. Thanks for the follow!! <3 NOw following you back from 3am Cloth Diapers No Pins Needed! nice capture, well blended color.. nice pose din ng model mo dito.. she looks healthy here. cute cute! hugs to your baby..sarap gigilan! !